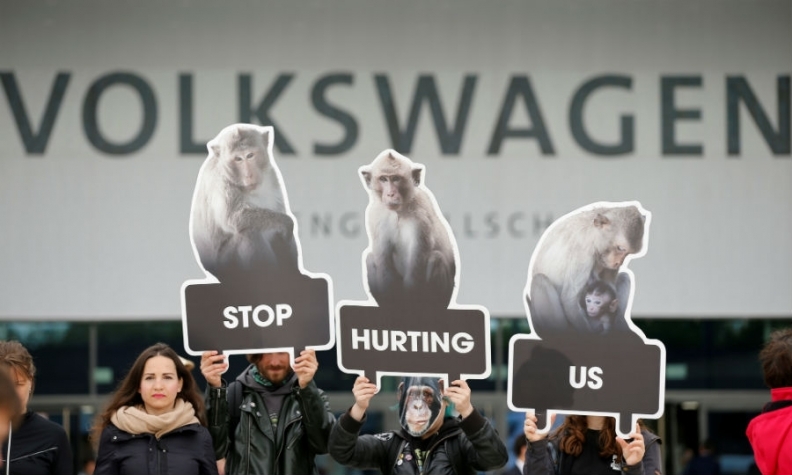 Animal rights activists demonstrate during VW's annual meeting. BERLIN -- Volkswagen Group will expand its internal whistleblower system to give the automaker a clear moral compass, its new CEO, Herbert Diess, said. It also is pondering spin-offs of non-core assets such as motorcycle maker Ducati and transmissions maker Renk, Diess told the company's annual shareholder meeting here. Diess's remarks on Thursday came as activists from People for the Ethical Treatment of Animals (PETA) demonstrated during the meeting against VW's involvement in tests that exposed monkeys to engine fumes to study effects of diesel exhaust emissions. The tests caused outrage and added to VW's troubles following its diesel-engine rigging scandal. Diess, who was appointed CEO of the 12-brand group last month, said VW will take steps to make its internal whistleblower system more effective and will also reinforce its compliance organization. The automaker's group-wide Together4Integrity program is taking its orientation from the principles of the Ethics & Compliance Initiative, a major standard widely used in the U.S. and recognized worldwide, he said. For the first time, VW has implemented a code of conduct for the entire group and developed a group-wide integrity program that is being rolled out across all brands and regions. Ethical "Golden Rules" have been introduced in vehicle development. In its supplier relationships, VW will align more closely with compliance principles, Diess said. "In addition, we will continue to work hard on ensuring that all of our products consistently conform to technical standards." Reports last month said VW's independent monitor, the former U.S. Deputy Attorney General Larry Thompson, has criticized the automaker for the near-absence of personnel measures in Germany after the diesel scandal. Thompson also lamented the lack of a "true cultural change" at VW. VW's anti-corruption czar Kurt Michels is creating a central investigation office to oversee compliance for the group's different brands and companies - which include luxury marques such as Porsche, Audi and Bentley and the mass-market VW, Skoda and Seat brands. To become more nimble, VW will possibly spin off some operations. "For non-core businesses such as Ducati, Renk and [large engines unit] MAN Diesel & Turbo, we will draw up sustainable future perspectives," CEO Herbert Diess. The deliberations could lead to steps to expand those businesses and to develop growth strategies, but spin-offs "are also conceivable," Diess said, without being more specific. Former VW CEO Martin Winterkorn indicted in U.S.